We here at Áiseanna Tacaíochta (ÁT) are committed to ensuring that all our communications and dealings with the general public and our supporters are of the highest possible standard. We listen and respond to the views of the general public and our supporters so that we can continue to improve. learn from your complaints, use them to improve, and monitor them through our Board. If you do have a complaint about any aspect of our work, you can contact Sarah Johnston, our Communications Officer, in writing or by telephone. Please give as much information as possible and let us know how you would like us to respond to you, providing relevant contact details. 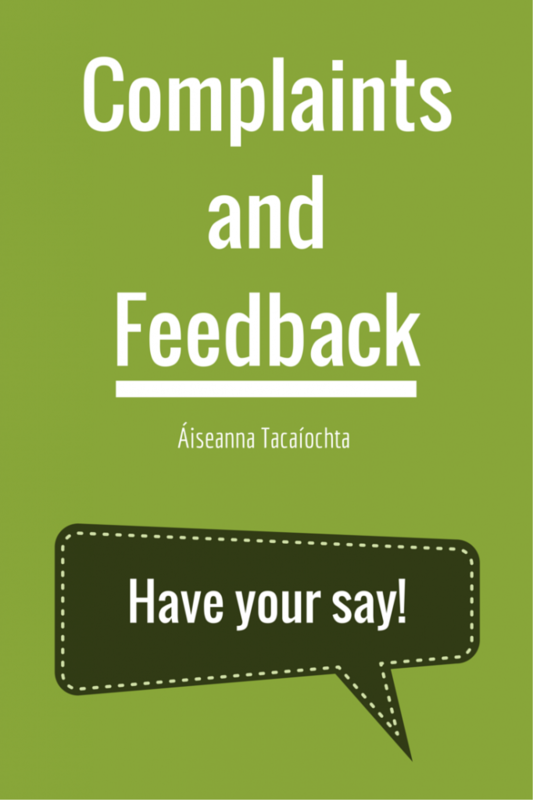 To submit your feedback or complaint in writing, send it to Sarah Johnston, Áiseanna Tacaíochta, City Junction Business Park, Northern Cross, Malahide Road, Dublin 17 or email sarah@theatnetwork.com. To discuss it by phone, call 01 525 0707. We are open 5 days a week from 9.00 am to 5.30 pm, and closed between 1.00 pm and 2.00 pm each day. If you complain in person or over the phone, we will try to resolve the issue there and then. Similarly, if you complain by email or in writing, we will always acknowledge your complaint within seven days, and do everything we can to resolve it within 21 days. If this is not possible, we will explain why and provide a new deadline. If you are not happy with our response, you can get in touch with us again by writing to our Chairman. The Chairman will ensure that your appeal is considered at Board level and will respond within two weeks of this consideration by Board members. In this case, please submit your complaint in writing, addressed to the Chairman, Áiseanna Tacaíochta, Chase House, City Junction Business Park, Northern Cross, Malahide Road, Dublin 17. Please not that this complaints procedure does not apply to ÁT staff or agents.